In evergreen perennial plant of the Asteraceae, large round leaves green shiny in is characterized. Many can be seen along the road of the mountain from the nearby coast. 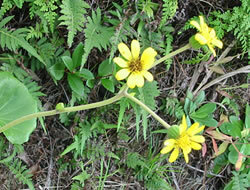 It is said that the New Year flowers are Tokashiki, bloom yellow flower to January from around the end of December. This time, can be seen everywhere in the village along the road and forest roads. Leaves and stems has antibacterial action, it is so is also treated as a medicinal herb and drink raw juice or taking infusion of things that were dried in poisoning of fish and shellfish. Part of the stem or to the stew and boiled can be edible, but it seems there is not much eating habits in Tokashiki.